Luke 23:44 - "There was darkness over all the land." He who excels all created things, and shares the Father's throne, humbled Himself to emptying, and took the form of a slave, and endured the limits of human nature, that He might fulfill the promise made of God to the forefathers of the Jews. But they were so obdurate and disobedient as even to rise up against their Master. For they made it their business to deliver the Prince of life to death, and crucified the Lord of glory. But when they had affixed to the cross the Lord of all, the sun over their heads withdrew, and the light at midday was wrapped in darkness, as the divine Amos had foretold. For there was "darkness from the sixth hour until the ninth hour," and this was a plain sign to the Jews, that the minds of those who crucified Him were wrapped in spiritual darkness, for "blindness in part has happened to Israel." And David in his love for God even curses them, saying, "Let their eyes be darkened, that they may not see." Yes! creation itself bewailed its Lord, for the sun was darkened, and the rocks were rent, and the very temple assumed the garb of mourners, for its "veil was rent from the top to the bottom." And this is what God signified to us by the voice of Isaiah, saying, "And I will clothe the heaven with darkness, and wrap it around with sackcloth." Matthew 27:45 - "Now from the sixth hour there was darkness over all the earth until the ninth hour." This is the sign which before He had promised to give them when they asked it, saying, "An evil and adulterous generation seeks after a sign, and there shall no sign be given to it, but the sign of the prophet Jonah" (Matt. 12:39); meaning His cross, and His death, His burial, and His resurrection. 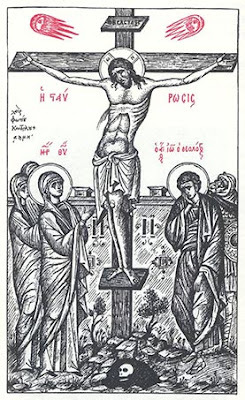 And again, declaring in another way the virtue of the cross, He said, "When you have lifted up the Son of Man, then shall you know that I am He" (Jn. 8:28). And what He says is to this purport: "When you have crucified Me, and think you have overcome Me, then, above all, shall you know My might." For after the crucifixion, the city was destroyed, and the Jewish state came to an end, they fell away from their polity and their freedom, the gospel flourished, the word was spread abroad to the ends of the world; both sea and land, both the inhabited earth and the desert perpetually proclaim its power. These things then He means, and those which took place at the very time of the crucifixion. For indeed it was much more marvelous that these things should be done, when He was nailed to the cross, than when He was walking on earth. And not in this respect only was the wonder, but because from heaven also was that done which they had sought, and it was over all the world, which had never before happened, but in Egypt only, when the passover was to be fulfilled. For indeed those events were a type of these. And observe when it took place. At midday, that all that dwell on the earth may know it, when it was day all over the world; which was enough to convert them, not by the greatness of the miracle only, but also by its taking place in due season. For after all their insulting, and their lawless derision, this is done, when they had let go their anger, when they had ceased mocking, when they were satiated with their jeerings, and had spoken all that they were minded; then He shows the darkness, in order that at least so (having vented their anger) they may profit by the miracle. For this was more marvelous than to come down from the cross, that being on the cross He should work these things. For whether they thought He Himself had done it, they ought to have believed and to have feared; or whether not He, but the Father, yet thereby ought they to have been moved to compunction, for that darkness was a token of His anger at their crime. For that it was not an eclipse, but both wrath and indignation, is not hence alone manifest, but also by the time, for it continued three hours, but an eclipse takes place in one moment of time, and they know it, who have seen this; and indeed it has taken place even in our generation. And how, you may say, did not all marvel, and account Him to be God? Because the race of man was then held in a state of great carelessness and vice. And this miracle was but one, and when it had taken place, immediately passed away; and no one was concerned to inquire into the cause of it, and great was the prejudice and the habit of ungodliness. And they knew not what was the cause of that which took place, and they thought perhaps this happened so, in the way of an eclipse or some natural effect. And why do you marvel about them that are without, that knew nothing, neither inquired by reason of great indifference, when even those that were in Judæa itself, after so many miracles, yet continued using Him despitefully, although He plainly showed them that He Himself wrought this thing.